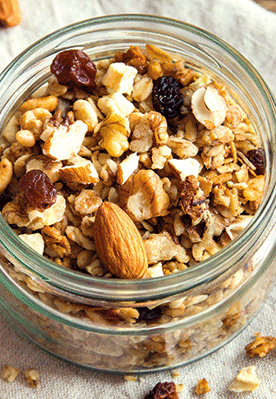 Granola is really easy to make and there is nothing stopping you doubling or tripling the recipe to make up a large batch as it keeps well in a sealed, airtight container. 1. Preheat the oven to 150ºC/gas mark 2. 2. Place the nuts in a freezer bag and bash with a rolling pin until they are in smaller bite-size pieces. I prefer doing this as it takes out my frustrations but also a processor tends to over process them and if you are not careful you can end up with nutty dust! 3. Place the crushed nuts into a bowl and add all the nuts and seeds. 4. Melt the coconut oil in a jug. Once melted, add the cinnamon and sweetener and combine well. 5. Pour over the nut/seed mix and stir well until the oil coats all the nuts. Pour the nut mixture onto a large baking tray. You may need two trays depending on the size of your tray. Spread until it covers the tray. 6. Pop into the oven and bake for 5 minutes before turning the nuts and baking again for another 5 minutes.